What did the one eyed monster say to the art thief….. Wait, this isn’t that sort of novel. Gideon Crew has been tasked with stealing a page out of a rare and valuable Book of Kells in order to uncover a map. Like any good map, it leads to a treasure worth killing for; something Google Maps really needs to work on. To follow the map Gideon needs a sidekick who knows ancient Greek and the tale of Odysseus. Off Gideon and Ami romp to find the McGuffin. 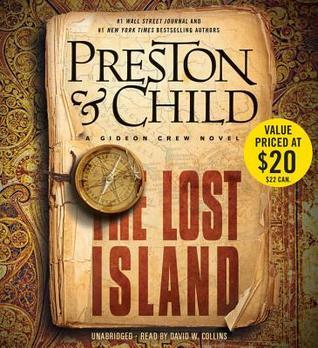 Douglas Preston and Lincoln Child rank somewhere on my favourite author list, since I’m a fan of their individual novels and their joint Pendergast series. So I was somewhat disappointed in my first outing with the Gideon Crew series. This isn’t a bad book, but it isn’t good either. Normally the usual “historical artefact can save/doom the world” trope is deftly handled by Preston and Child. They wrap enough interesting characters and plotting around the improbable to make it all work. But the minor characters weren’t that interesting and Gideon was not a character I connected with. You could probably replace Gideon with an amorphous blob of sentient putty and I’d have been more engaged. And you need this engagement because you have to ignore how ludicrous a race of cyclops are – seriously, just wouldn’t have evolved: not plausible at all. I doubt I’ll return to the Gideon Crew series and will instead stick with Preston and Child’s other (superior) works.